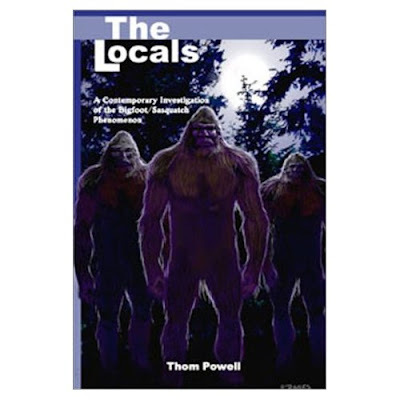 In Thom Powell's book, The Locals, he writes about his discussion with a government employee, of an injured bigfoot that was sedated, treated for burn trauma and then released. It is a compelling account of how a sasquatch was saved by humans, and the government cover-up that followed. 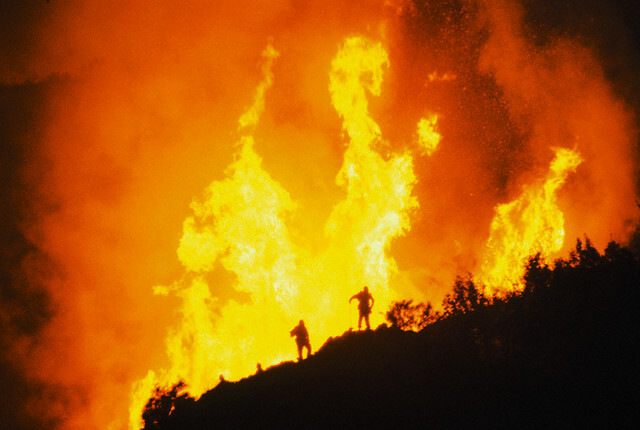 The parallels to Jordan's encounter in the same region prompted me to introduce you to the Battle Mountain Fire incident, for those of you who have not yet read about it. Click Here to read the story on Bigfoot Evidence. Check out Thom Powell's blog, or get a copy of The Locals by Clicking Here. 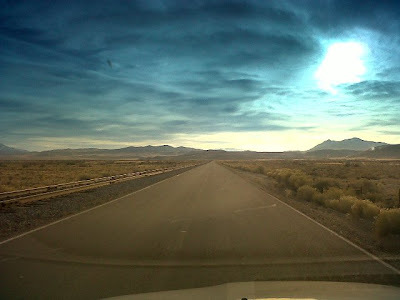 To read Jordan's January 2012 Nevada bigfoot encounter, Click Here. GREAT OPPORTUNITY - Click Here! 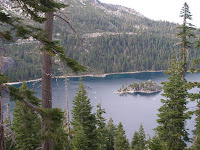 Melissa Hovey has released this photo on her blog, The Search For Bigfoot. The photo is copyrighted by the American Bigfoot Society, and should only be used for educational purposes, and with leaving the copyright stamp at the bottom of the page. Please read more by clicking here. -Hair looks to be coming out of the skin, not mottled clumps glued to a suit. -The detail seen in the skin. Most notably, an apparent recent wound on the lower left trapezius, that looks to have had dermis exposed and then it healed over. The skin also seems to have dirt built up, with splotchy dark spots around the pores. This is caused by the oils in the skin, exuded out the pores and then having the dirt build up around the pores, getting trapped by the oil. -The thinning gray hair, just as we'd find on an older human. If you were going to hoax, wouldn't it be easier to use so much fur, that you couldn't see skin and need to do all that cosmetic work to the skin to make it look realistic? -The musculature, especially the deltoids and how the trapezius rise up to the base of the skull, leaving no visible neck. -It could be a very well done suit or dummy. Hollywood make up artists can do this kind of stuff. BUT who would put in the hundreds of hours it would have taken to insert all that hair, one by one, into a latex form? Just to hoax a bigfoot blogger? Wouldn't you think they'd rather get the publicity of sending it to Fox News or CNN? To me, this is way too elaborate to be a hoax, considering the person they are trying to hoax. Why would a hoaxer, go to that extent to hoax Ms/Mrs. Hovey? Please read more on her blog about how she obtained the photo. I respect the manner in which she communicates with the witness. To read more, click here. So many want to tear a witness down. It takes a tremendous amount of courage to come forward with stories of encounters. In my eyes, RESPECT is first and foremost. Witnesses are where we learn the most from, until that time we are lucky enough to experience the same things the witnesses have, while we are out conducting field research. I don't think any of us really have. Not to the extent that some witnesses have. That's why we do what we do. We squatch. 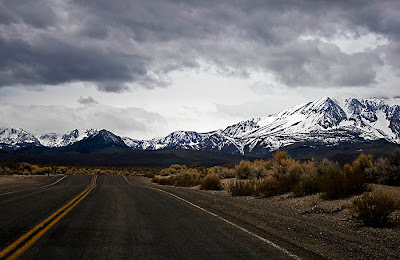 In BIGFOOT: Nevada Sasquatch Encounter Lasting Several Hours, Part 2, I mentioned my thoughts on that the sasquatch Jordan encountered may have been scouting the highway for roadkill. Jordan had seen a fresh bloodstain on the highway, when he walked several miles back to his car from the gas station. A recently posted report on BFRO.net, details the encounter that a tow truck driver had in Montana, after a car hit and killed a young elk in January 2011. Click here to read that report. If you're a Tweeter, click the button above to follow us. 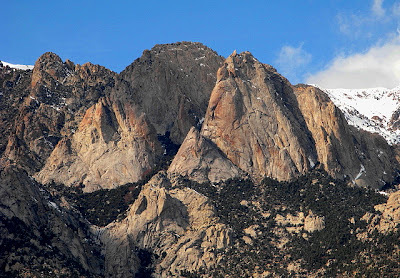 You will get updates whenever we make a new post, such as bigfoot sighting reports, videos, pictures, and news as it pertains to the world of sasquatch in Nevada, and the Sierra Nevada Montains. "I was just reading your articles on the Sierra Tahoe sighting and saw your photos of the Ruby Mountains. My ex and I used to camp up in those mountains a lot. And I can tell you from experience, they are VERY active. I used to drum. So I'd take my doumbek with us and play it in the evenings after dinner. Well, this was before I'd heard about tree-knocking. All I know is that every night we stayed there we were woken up consistently with knocking noises, howls and the sounds of something very big walking around our campsite." I then asked her if she could follow up with a timeframe of when these incidents occured, along with a little more detail. "It was during the summer months...mainly July and August, sometimes early September depending upon the weather. We used to live in Mariposa, CA so we would drive over Tioga pass to camp on the eastern slopes of the Sierras and explore the dirt roads and canyons of Nevada. We never used a tent. Just spread our bags right on the ground. 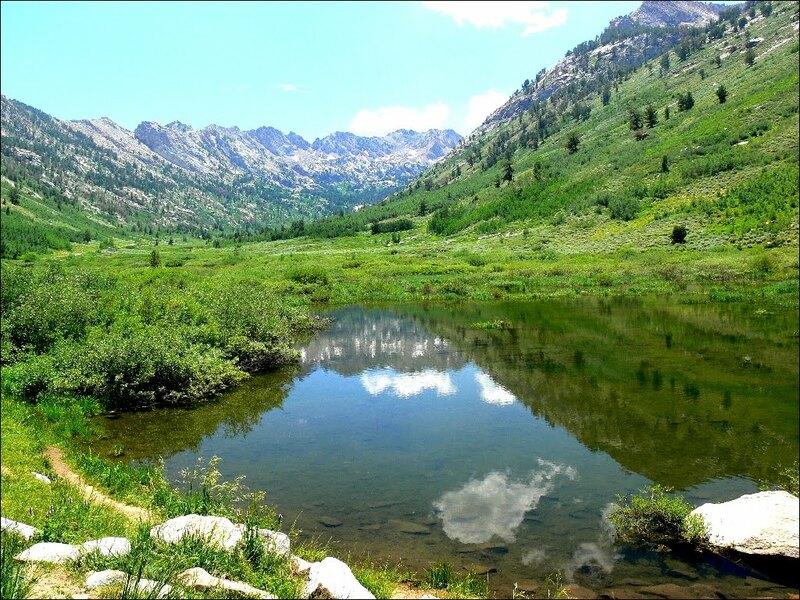 The time frame on our experiences in the Ruby mountains took place in the early 90s. We'd go over there fairly regularly 1990 thru 93. In hindsight, now that I've learned about tree-knocking and the like, maybe my drumming in the evenings "notified" them to our presence. Maybe that is what helped bring them in at night. But there was always a lot of activity around us in the dead of night. It was a little "unnerving" a few times. At times, we were hyper-vigilant but not worried enough to pack up and leave. Nothing was ever thrown at us. We would be awakened by howls and a few whoops very similar to some of those in the BFRO archives. And the sound of movement off in the dark." Lastly, I followed up with a question about the times she spent on the eastern side of the Sierra Nevadas. "When you come down Tioga pass road from Yosemite you go down the hill heading towards Nevada and on the right side you'll see a large Pelton wheel that I believe SoCalEd operates. Well, continue all the way down the hill and just before you come to 395 there is a campground on your right side. It's very close to the water, with thick, lush trees. We used to camp in there and got pelted with small rocks. It's a very nice little oasis campground and I've never seen too many other people in there whenever we were there. 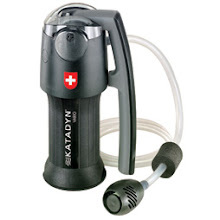 I think most people just shot by it and went on to Lee Vining or June Lake." Thank you for sharing your observations with us. When I read that she was playing her drum before the activity started, it brought a smile to my face. There have been many sighting reports relating to the playing of music. Knocking could be attributed to Bighorn rams butting heads. That's one possibility that comes to mind. Birds and coyotes can make some unusual sounds to explain the howls and whoops. Then there may come a time, when you hear a "whoop" that makes the hair on your neck stand up, because it is so loud, even from a distance, it really gets the mind racing, because you know it wasn't a bear, deer, bird or canine. It's most definitely primate. I've experienced those kind of whoops, along with guttural type jabber. After an hour of that, it made a believer out of me that something, probably sasquatches, were the only remaining explanation. Non-believers, think what you may, but until you've gotten off the couch, and slept out in remote wilderness for a few days, and have experienced those sounds and other phenomena for yourself, don't be so quick to judge. 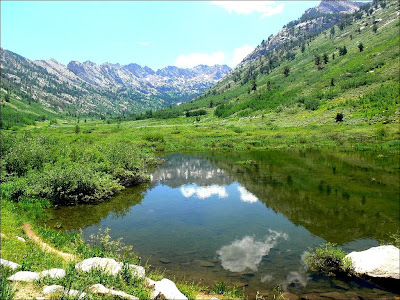 Comments on "BIGFOOT: Nevada Sasquatch Encounter Lasting Several Hours, Part 1"
I'm not sure how often the blog comments get read. There is a small link that says, "Comments" in blue, at the end of each article. Being so obsure, I'm not sure if most readers even notice it. I'm posting this comment to the main board for all to read. Jordan's in-laws gave their thoughts on the incident, and express how profound of an experience this was. After receiving Jordan's report, I immediately, I emailed him some of my thoughts on his encounter that occurred January 8, 2012. Jordan was pretty shook up, as most are after such a close encounter. I'm sure that second time when he opened his eyes, that it was like staring into the face of the boogey man. He was confused and a little freaked out. I wanted to try and put his mind at ease, and let him know that he had the rare privileged to have had an interaction with them. I've heard reports from that area, so I wasn't surprised on hearing about his. In fact, it made me very happy. It has been an area of Nevada that I've been wanting to make some recon trips to, so this justifies my theory. While hallucinations are common with hypothermia, I think he seemed lucid enough that he was not seeing things. Especially with the palm print he found on the car. The shaking of the car is not an uncommon event, and the chattering he heard, though rare, were similar to the Ron Moorehead recordings. I'm convinced that he encountered at least one sasquatch, with a second, maybe a juvenile that kept it's distance. The chattering he heard was the two sasquatch vocalizing to each other. CLICK HERE to listen to an example, similar to the chatter that Jordan heard. My theory has been that if there is a bigfoot population in that area, which I believe there is, that they head toward the Humboldt River to hunt for deer, antelope and coyote at night, and that they possibly spend their days at higher elevations. 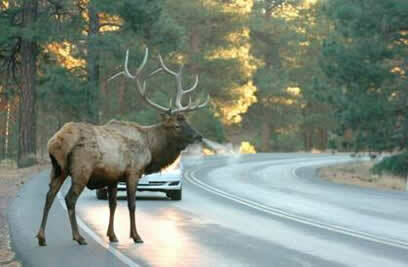 I think they also cruise along the highway to look for roadkill for an easy meal. There has been quite a few reports of this occurring around the country. I know I've seen rabbits, snakes, fox and coyotes dead on that stretch of road, so it only make sense to me. I've also seen burros and mustangs that have also met there fate on roads across Nevada. Not to mention all the free ranging sheep and cattle in the area, that would surly make an easy meal. Jordan told me that when he was making the walk back to his vehicle, he did see a fresher blood stain on the road. Whatever it was was no longer on the road. The mountain ranges on both sides of the Humboldt River, have many naturally occurring springs and perennial streams. Though northern Nevada is considered mostly high desert, the mountains contain stands of cottonwoods, aspens, juniper and pinion pine. I've seen wild currant bushes in these areas also. Wild mustangs, mule deer, antelope, burros, mountain goats, bighorn sheep, mountain lions, bear, bobcat, marmot, and a multitude of game birds also make their homes in these mountains and high desert. These mountains hold many caves and old mine shafts for shelter. The Lovelock Caves, where the "Red Headed Giants" were killed, is only about 40 miles from the location where Jordan had his encounter. Nevada, especially this area, is one of the least densely populated areas in the U.S. Less people of course makes good wildlife habitat. Less people also means a much smaller chance for bigfoot sightings. I think this is why there are far fewer sightings reported in Nevada overall. Us, of the squatchier intellect know sasquatch can be curious. I think that, in some way, they/it may have known that he was in distress, and they were checking to see if he was OK. Who knows? Maybe they were trying to keep him awake because of the cold. If they wanted to harm him, they easily could have, but they didn't. What sticks in my mind is that they hung out, and kept an eye on him, basically until the NHP showed up and got the car back on the road. I've heard squawks and whoops, and have had them near our camp at night, but never so close an encounter. There has been 3 instances when I know there were a squatch or two around me, and I know they are capable of tearing me apart, but they seem to just want to be left alone. Please know that many can be inquisitive. Others avoid humans like the plague. I know Jordan must have been a little traumatized, especially being alone, and not able to shut the window. I envy him, and feel for him at the same time. Now I'm sure he believes they are real. I let him know that many of the world's top scientists believe that sasquatch exist, so he can be assured that I don't think he was losing his mind when all this went down. "I really appreciate you writing me back. I agree with all the theories. I thought about the roadkill. There actually was a big blood smear not too far from where I was that was still wet. I passed it walking back to the car. I've done so much research since this happened that I need to go further and find more physical evidence. I can agree that they seemed to be checking on me in a way. Never did anything to feel violent. It was funny how when I laid back down that the Envoy would shake. Almost as too keep me awake. I'm also certain there were 2. I heard 2 voices both in different spots too close together in timing that one couldn't have moved that fast. Also I can't believe the stealthy way of moving. I never heard a sound unless it was deliberate. I went through again 2 days ago and didn't stop but got a better view due to the fuller moon. I know the exact spot and have looked at maps and there is nothing but open area. Perfect to disappear in." I hope to get in a week or two up in that area this summer. Nevada has an amazing beauty that most don't realize we have here. There's a lot more to us than Casinos and gold mines. CLICK HERE to see what Nevada has to offer. I received this report a few weeks ago. I wanted some time to pass, to let this gentleman's experience, have time to settle. When someone has an encounter of this magnitude, it is a life changing experience. 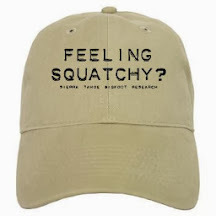 I know a few people who have had very close encounters, and thinking about sasquatch has literally consumed them. I asked his permission last week if it would be alright for me to post his story here. Obviously, he gave me the OK. I had an experience the other night that is leaving me feeling a little crazy and confused. I however know I saw something and heard things I cant explain. After seeing markings on my SUV and reading online I have decided to share the experience with you. Maybe this will confirm my theory and help me feel like I am not insane. Let me tell you about myself first. I'm 29 going to be 30 this month. I have 3 kids and I'm married to a wonderful down to earth woman. I'm originally from San Diego and moved to the Dayton area about 6 months ago so my wife could be closer to family and we could escape the rat race. I took a job as a mechanic for a mining company in the Elko area. I commute to Crescent Valley on my weeks on and come home on my weekends till we find a house closer to my work. Anyway I make this 4 hour drive about 6 times a month. About 3 months ago I ran into a rash of car trouble in that area. So far I have had a tire shred on my truck that almost put me on its lid, a radiator blow apart on the same truck, a truck I borrowed lost an alternator there. Then this last time. I left Crescent Valley about 8 pm. I was talking to my wife on the phone when i ran out of gas. I usually make it to nearest gas station. I tried to get help for a few hours to no avail. Police said, "Tough." and the local tow company would tow me but not bring me a gallon of gas to get into town and people stopping to see whats going on apparently isn't allowed. They just get over and speed up. Eventually a NHP officer pulled up and offered me a ride to the gas station, but then he had to leave while we were there so I had to walk back with my gallon of gas. Took about an hour and a half because I was cold due to not having proper attire. I put the gas in and tried to start the SUV. Now I've got a DEAD BATTERY. Again no help from law enforcement and the on-call tow operator was TOO LAZY TO GET OUT OF BED AND HELP. Long story, ended up with my wife and myself just being hung up on. So I figured I'll have to wait till I get a friend to wake up and come help. I tried to warm up best I could. No jackets, just 2 light blankets in the car and a balaclava from work. Did I mention my drivers window was stuck down? It was now low teens as far as temp. I'm laying in the drivers seat, when I feel the car rock side to side. Nothing had driven by and there were no cars for miles. I sit up and look around. Not a damn thing anywhere. Just dark and cold as hell. I light a cigarette and look around outside. I was just out there trying to flag down cars not 20 minutes before, and I saw nothing around. No one had driven by in a while so I laid back down. I cruised my phone for a few and felt tired. Its 2:20 am. I'LL NEVER FORGET THAT TIME. I was on my side facing the passenger side. After I focused on the window, passed the glow of my phone, I saw a face in the window. Wasn't human. Wasn't a dog. Not anything I've ever seen. I could see the glow from the phone on it. I blinked, and it was gone. Shook my head and thought I was hallucinating because I was bordering on hypothermia. About 20 minutes later I wake up not knowing I was asleep and I lying flat. Over the hood, I see a figure. Same face I saw earlier, just darker. Then it was gone. Wow! "I'm losing it." I start thinking to myself. I feel very tired at this point, so I lay down again. Facing the drivers door I close my eyes. A few minutes later I have the feeling of a presence and open my eyes. There's a figure at the open window just inches from my face! I don't move, but look up and see it is above the car. This is a GMC Envoy SUV. I'm 6'4" and barely can see over the top. I move, and it slips back behind the door so I cant see. Holy sh*t! I wasn't hallucinating now. I saw something. I sat up and looked around. Stuck my head out the window. There was nothing there. Wow! So I light a cigarette and sit up towards the steering wheel. Its so cold, I don't even know what to compare it to. Still no help either by the way. A few trucks go by. I try too see anything in the headlights. Nothing. Looking at the center divide which is a ditch about 20 yards across., I see a dark mass that moved a little bit. I figured it a deer, or a bush. There are no bushes here though, so it's not likely I see the only one and swear it just showed up. After seeing that I'm sitting looking out the windshield smoking and I hear a low gurgle talking sound. Never heard anything like it in my life. Almost like the predator was speaking gibberish while gargling. I look. There's nothing there, and it came from the center divide. THAT WAS NOT EVEN QUESTIONABLE AS A FIGMENT OF THE IMAGINATION. I heard it. Few seconds later I hear it again but its louder and right at the front of the car. I dip my head out the window, and look but again, nothing was there. Somewhere, I fell asleep again and was awoken by another NHP at 6:32 am who thought I was frozen to death. He helped me get going to fuel up and get home. Everything is fine and I get home OK. Feeling a little weird from the cold experience but I'm still kicking. Now I can't get what I saw out of my head. Can't get what I heard out of my head. I explain what happened to the wife and she seems to get it. Then I do research, and can't find anything related to cryptozoology for that area accept one bigfoot article. It fits the description of what I saw pretty well, and I find a recorded speech pattern that I can hear what I heard on the side of the road up there. Not exact, but I can hear it. So today, January the 8th, we go to look at the car to see if there's anything on it. We find hand prints with fingerprints in areas that match pushing the car to shake it. All around the body the dirt is swept away. Obviously from a hairy mass rubbing on the sides and rear bumper. You can see where the car was leaned on for a few while looking in the windows, and where I startled it and it backed away from the window. I can prove it too. I took pictures. The hand is much bigger than mine and new to the car but not done here because it has a layer of road dust over it from my drive home. 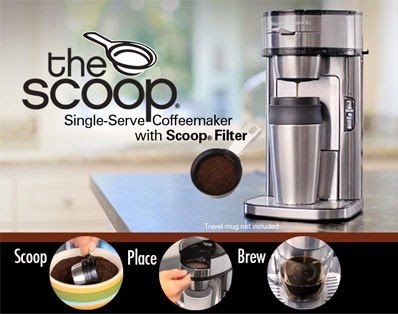 Review this and let me know what you think. I believe what I saw and experienced, and no one will convince me otherwise. I thought you might be interested in my story. I immediately replied to Jordan after he sent me this report. I addressed a few points regarding bigfoot habitat and sightings in this area, hypothermia, the vocalizations, and a few other points. I will follow up in a day or two on those points, as well as I will post the photos he sent of the palm and finger prints from the tailgate of his SUV. Most people are very reluctant to share their experiences. Again, I want to thank Jordan for his report. I recently received a comment related to a past article, "VIDEO: Tracking Bifoot in the Sierras." 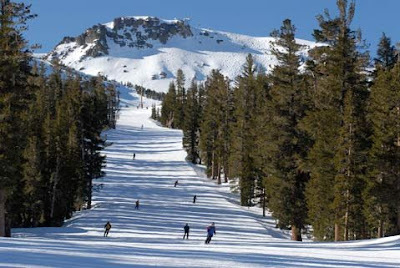 "My best buddy and I were skiing at Mammoth mountain in 1989. When a storm blew in later in the afternoon! We rode chair 23 right before they closed the top of the mountain and took our time coming down the face in the whiteout conditions. We took the wrong way down on a run that was already closed(mid mountain) and came to a intermediate run that was vacant. We were doing about 20-30 mph when(I was first) came around a bend and to the left up on the fall line by the tree break...was something I will never forget. It was standing there on two feet with snow on it's fur..just watching us go by! When I got to the end of the run...about 1/8 mile away...I turned to ask my buddy....but before I could speak..he said"what the hell was that"? ...we saw bigfoot that day. James"